After being a tournament fixture since the beginnings of the old Avaloncon, March Madness was in danger of losing its status as a Century event this year. Fortunately, this popular event was voted back in by the membership, who backed up their votes with attendance - which at 45 participants, was up again slightly this year. Part of this may be attributed to the fact that for the first time, it was run as a 'B' event - putting out the welcome mat for new players. Based on feedback I received, I'll probably move the demo to earlier in the week, so we can introduce even more would-be coaches to this fast-playing game. The format this year was the same one introduced last year, where we moved away from pre-generated brackets for each of the four heats. Traditional Pacific Rim powers such as UCLA were still placed in the West regional, UMass in the East, and so forth. Anyone who pulled an upset was still rewarded by their section of the draw opening up. The move to a new venue didn't change much, except that we were less crowded than usual. Heat 1 had 14 participants, who played legendary teams from San Francisco '56 to Arkansas '95. Devin Flawd, current Consul, was unable to repeat his past success in March Madness, as he fell to Roger Taylor's 1970 New Mexico State team. Former champ Dennis Nicholson steered his Arkansas '95 Razorbacks to wins over Oklahoma '88, UNLV '77, and UCLA '70 to make the regional final. Sean McCulloch, meanwhile, moved steadily through the other half of the draw with the top seeded UCLA '74 Bruins, defeating Marshall Collins, Derek Landel, and Roger Taylor in succession. After a hard-fought victory over Dennis, Sean was in the Final Four for the second year in a row. Sean's opponent would be none other than Bruce Reiff, who has won more March Madness titles than anyone in the history of the event, including an unmatched three consecutive titles from 1997-99. Bruce showed that experience counts, leading the 14th seed to a win in the South regional, the best showing of any of the lower seeds. At halftime of the first Final Four matchup, Bruce's chances for another title looked good, as he led Sean 40-37. But in the second half, UCLA's suffocating defense allowed Bruce's team only 14 points, and Sean prevailed, 77-54. The Mideast regional had relatively low attendance this year, as it seemed there were simply too many other events, now that the convention was in full swing. Still, there were a lot of exciting games among the 15 participants, including a rematch of the famous Larry Bird-Magic Johnson matchup in 1979. In the end, former Caesar Marvin Birnbaum won that game, and also coached his Michgan State '79 team to wins over defending champ John Coussis, Carolyn Demarco, and Harry Flawd to reach the Final Four. Also notable was the debut of Jim Fishkin, who knocked off Chris Bauch's top-seeded Cincy '61 team, and then eliminated your friendly GM before losing to Harry. The East regional generally has the highest attendance, and this year was no exception, with 24 players vying to place the last team in the Final Four. It was a tough heat for former champs, as four of them fell before the quarterfinals. John Coussis, however, looked to have a chance of repeating his 2004 triumph, with wins over Peter Stein, Mark Yoshikowa, and Terry Coleman. But in the regional final, John Ellman drew on all his experience from many years of running the event to derail the Coussis Express. So the second semi of the Final Four would pit the savvy of John Ellman, in his first trip to the Final Four in more than a decade, versus 'Mr. Caesar' himself, Marvin Birnbaum. 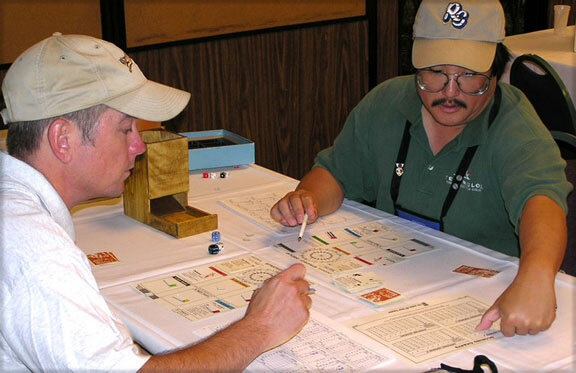 Anyone who has faced Marvin across a gameboard realizes that he picks up on game systems very quickly. Yet, for all the game's supposed simplicity, Marvin had never made even a regional semi prior to this year. In 2005, however, Marvin brought the same intensity to basketball that he shows at games like Paths of Glory or We the People and he rolled a few hot dice to boot which never hurts. After dismantling John's Loyola-Chicago '63 team in the national semi, Marvin then beat Sean's top-seeded UCLA 1974 team to take the crown. So, if Marvin should finish high up in the Caesar/Consul standings again, you can blame me (but only a little) for introducing him to March Madness. Once again, the format seemed to go pretty well, as the heats generally finished quicker than the older, more traditional format. Everyone seemed happy with the play-balance of the tournament, which seems borne out by the fact that only one of the top seeds made it to the Final Four (and even that team lost). My thanks to all my Asst GMs, but especially to Peter Stein and Stuart Tucker, who ran two of the heats when I was detained at work. And thanks also to Debbie Bell for the score sheets she graciously donated. Finally, my thanks to everyone who voted us back into the Century. Chances are, as events continue to grow in size, we'll likely need your votes next year, too. See you then. Jim Gutt emerged victorious over a 29-player field in the 2nd Annual BPA March Madness PBeM Championship. Jim's 1992 Cincinnati squad used defense and strong bench play to defeat 2005 WBC champion Marvin Birnbaum's 2000 Florida squad. It looked like an early runaway, as Jim's Bearcats jumped out to a 41-24 halftime lead. Marvin closed the gap when the Offensive Specialist improved his "F" rated guard to the "AA" bench rating and scored 19 points. The game was tied at 60 with just two positions remaining to be resolved and all timeouts and coaching moves exhausted. But Jim received a two point cushion when Florida coach Billy Donovan received a technical foul, and low scoring rolls allowed him to hold on for a 66-63 victory. Cincinnati's left forward Herb Jones was named the tournament MVP, as he averaged over 23 points per game for the Bearcats, including 30 in a quarter-final win over Paul Risner's 1972 Tar Heels. Also named to the all-tournament team was center Marvin Barnes of 1973 Providence, forward Mike Miller of runner-up 2000 Florida, guard Kendall Gill of 1989 Illinois, guard Tyus Edney of 1995 UCLA with special mention to the 1992 Cincinnati bench, who scored 26 points per game with their "B" rating and held the "AA" rated 2000 Florida bench to just 10 in the championship game. Of the 57 games played, the average margin of victory was 11 points, with eight decided by three points or less. Also claiming laurels were Pail Risner, Terry Coleman, Sean McCulloch and Ric Manns who finished 3rd thru 6th respectively.